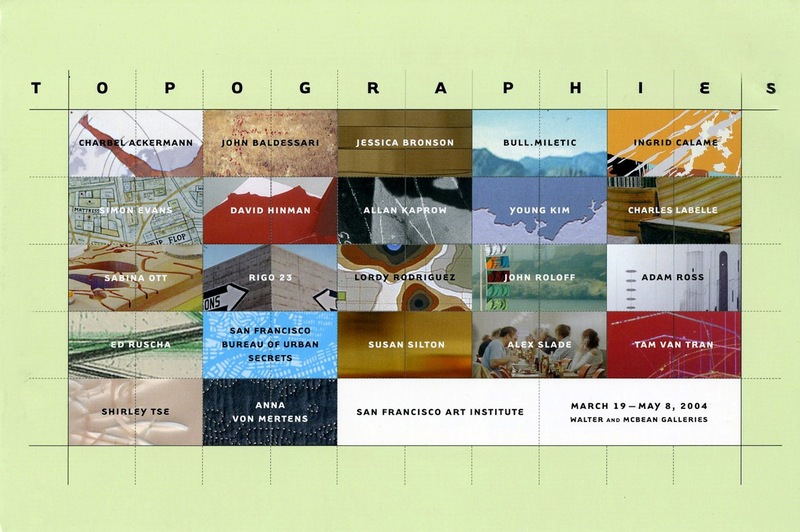 Topographies focused on artists whose works explores different types of typographies using, maps and cartographic strategies or recording and marking specific geographic sites. 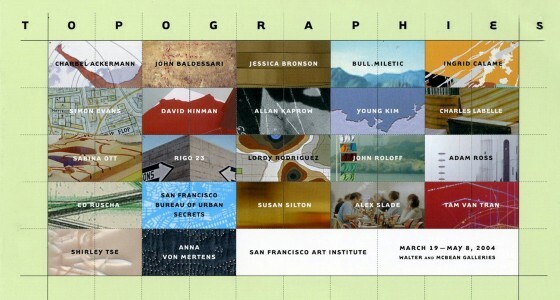 The artists in the exhibition included John Baldessari, Allan Kaprow, Ed Ruscha, Charbel Ackermann, Jessica Bronson, Bull.Miletic, Ingrid Calame, Simon Evans, David Hinman, Charles LaBelle, Young Kim, Sabina Ott, Rigo 23, Lordy Rodgriguez, Adam Ross, John Roloff, San Francisco Bureau of Urban Secrets, Susan Silton, Alex Slade, Shirley Tse, Tam Van Tran, and Anna von Mertens. Topographies opened with John Baldessari, Allan Kaprow, and Ed Ruscha’s conceptual work of the 1960s that document and transform a specific site of natural topography, locating oneself or one’s actions within nature or the urban environment, and remapping or reimagining a space or place. 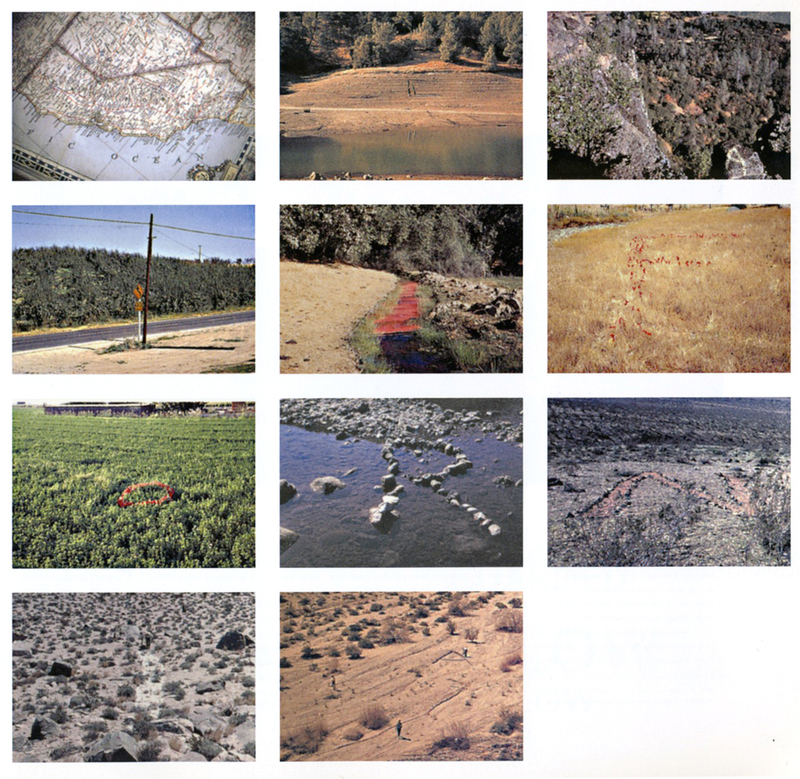 Baldessari transposed the letters that spelled out California on a map to their actual sites in the landscape (starting in the south part with the “A” in Joshua Tree National Monument and ending with the letter “C” at Shasta Lake) rendering the letters in pigment, frocks, yarn, and other found materials, and documenting them in an aerial photograph. 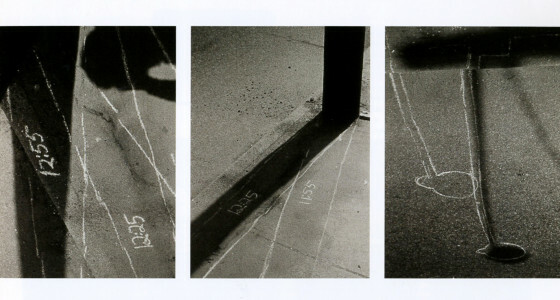 In Dial, Kaprow instructed participants to trace the shadow of telephone poles along the street, retracing them every fifteen minutes. 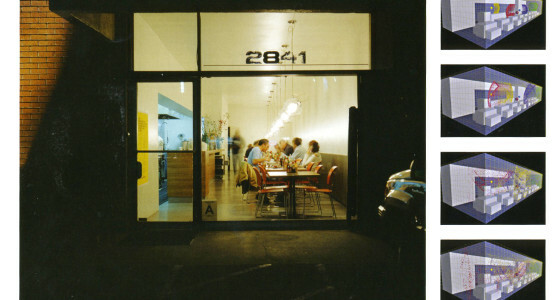 And in Los Francisco San Angeles, Ruscha creates an imaginary hybrid city from the streets of San Francisco and Los Angeles. 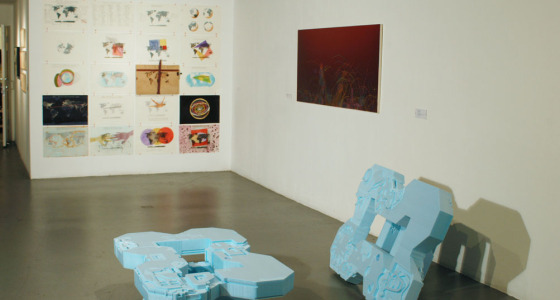 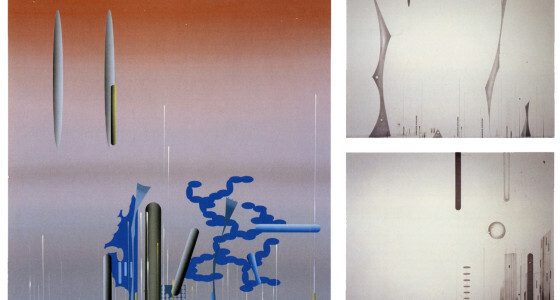 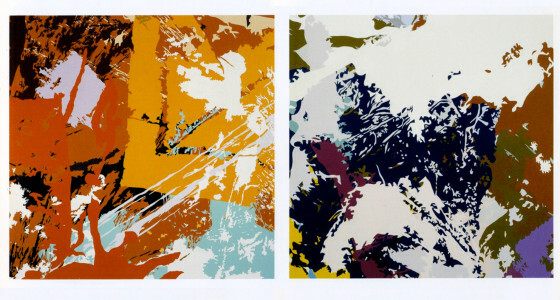 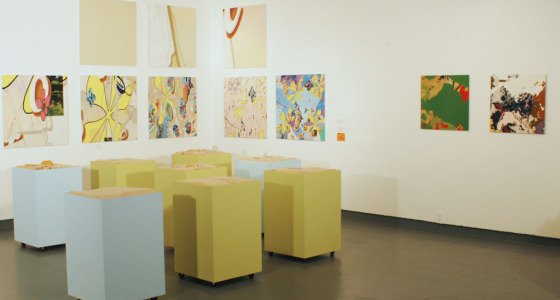 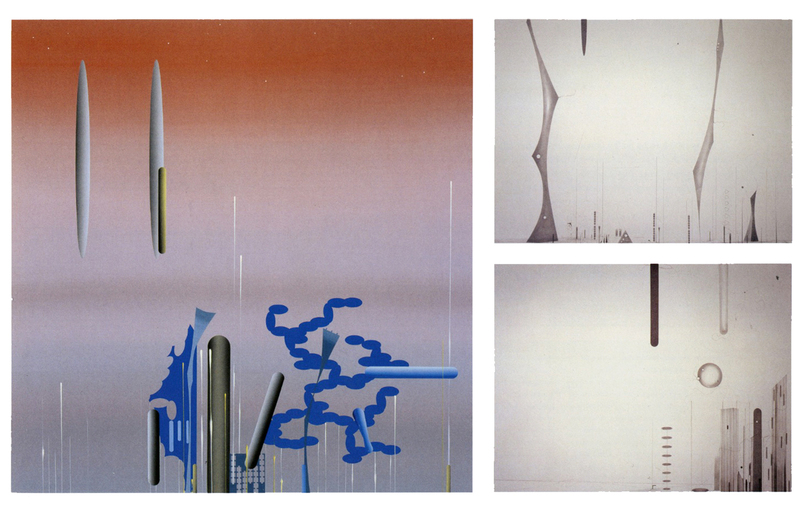 The other works in the exhibition used similar cartographic strategies. Young Kim’s series of panels can be read as horizons or as aerial views of coastlines. 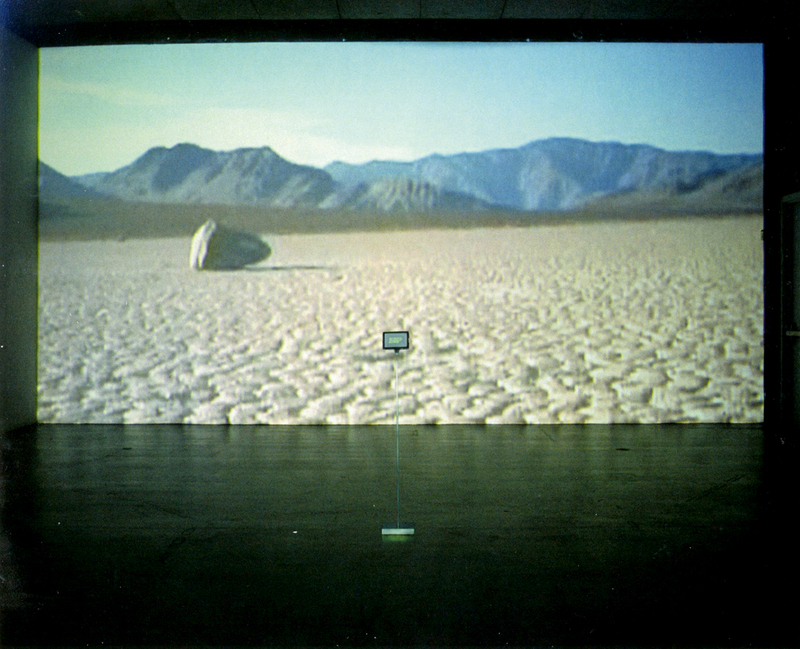 Bull.Miletic’s (the team of Synne Bull and Dragan Miletic) installation You Are Here, featured a video projection of a robot mapping the terrain of the the Racetrack Lakebed in Death Valley. 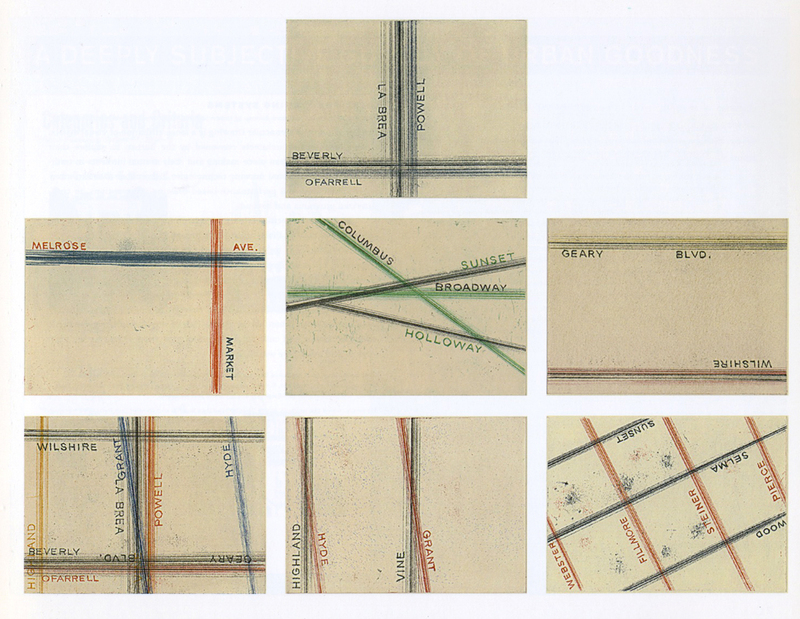 John Roloff created his own system of geotaxonomy and then made flags that pictorially represented different sedimentations and layers. A few artists focused on capturing aspects of movement within nature: Susan Silton’s hemidemisemiquaver—a video shot as the artist spun around in a circle—captures the horizon at different sites at a warp speed. 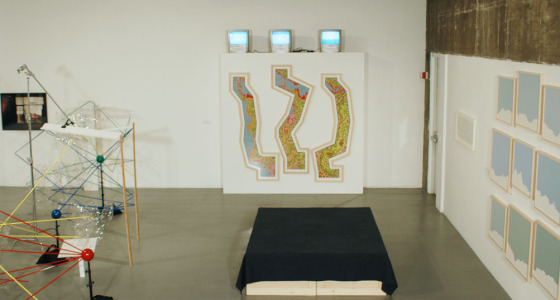 Anna Von Merten’s interactive map invited visitors to trace their individual migration patterns, while her hand-sewn topographic quilt revealed the wave currents in the Pacific Ocean. 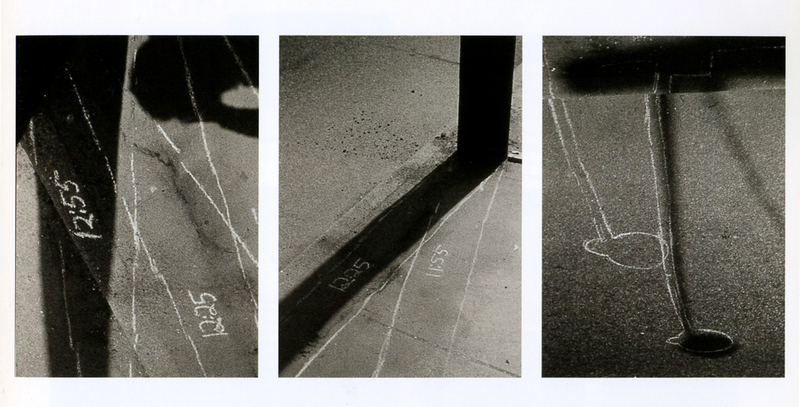 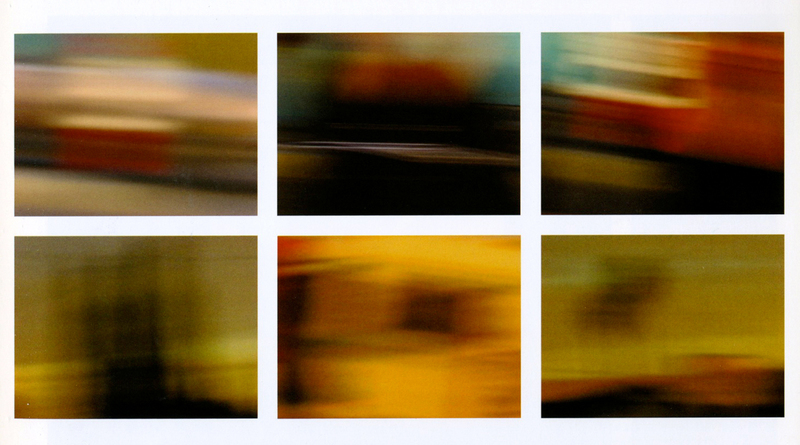 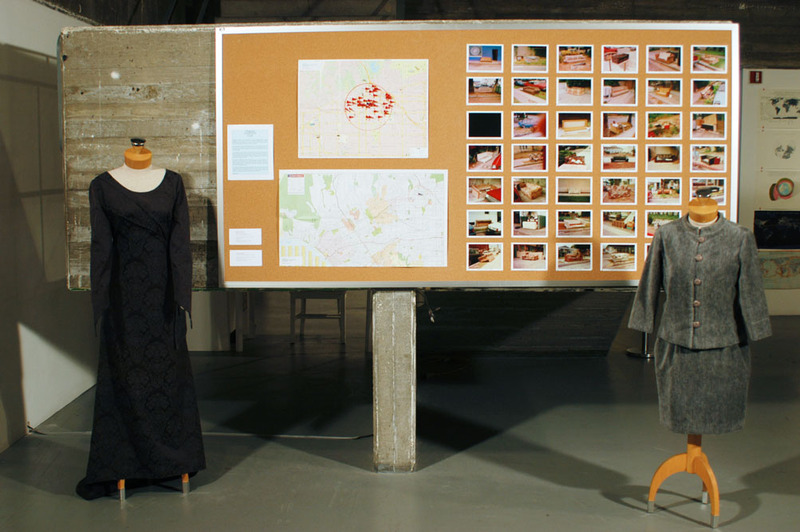 Some artists explored urban spaces, tracing live experience. 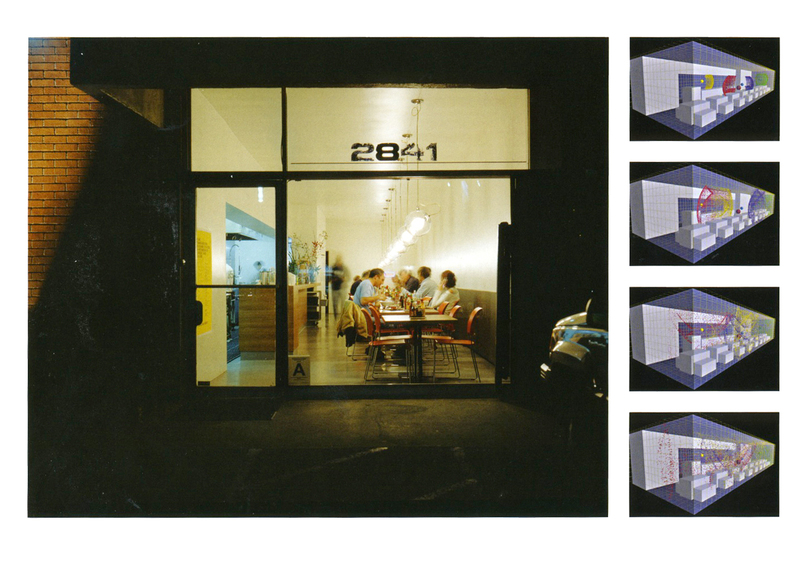 Charles Labelle documents urban lives and sofas close to his home in Hollywood. 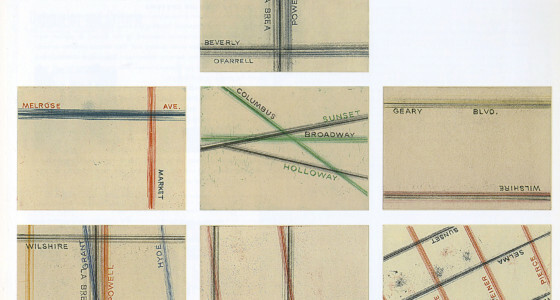 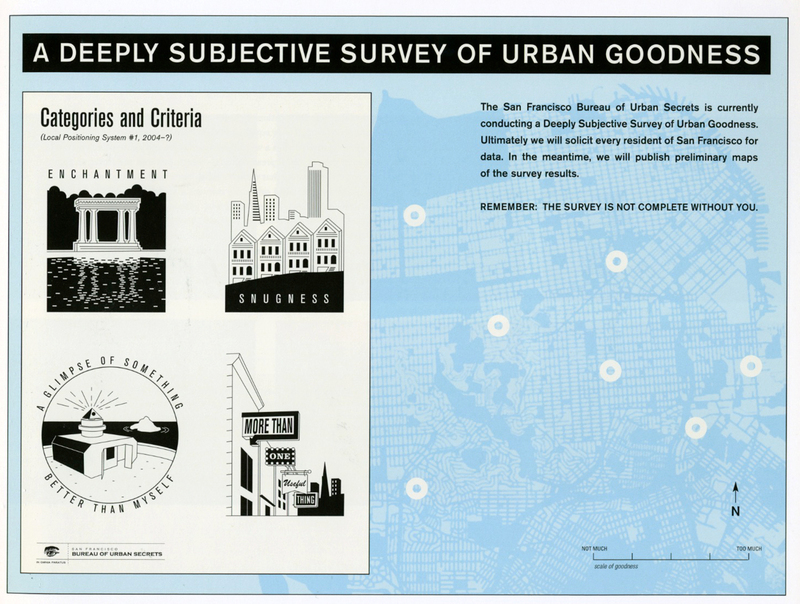 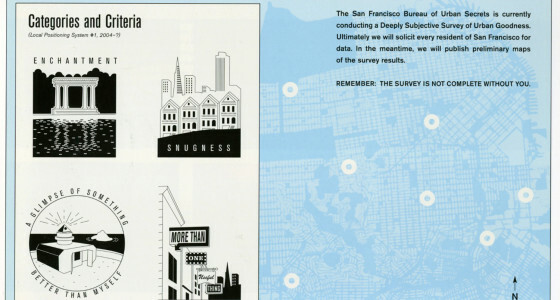 Ingrid Calame traces the urban environment in her enamel and aluminum renditions of the superimposed stains she found on sidewalks, as does San Francisco Bureau of Urban Secrets’ playful and useful A Deeply Subjective Survey of Urban Goodness. 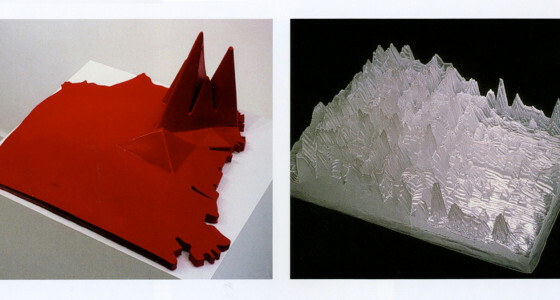 Others are concerned with imaginary landscapes and invented territories. 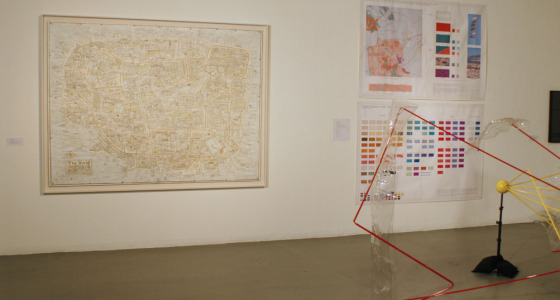 Lordy Rodriguez creates hypothetical territories by taking existing maps and deconstructing their standard topographical symbols and color coding through reconfigured drawings. 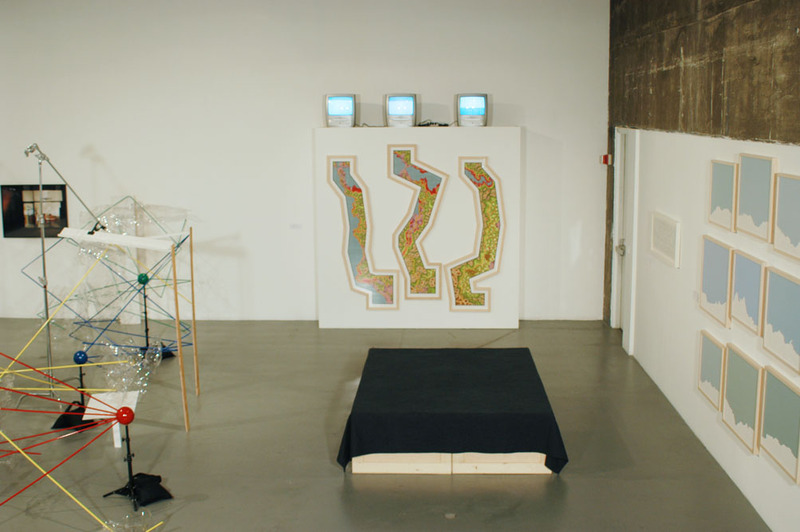 In his installations, Rodriguez combines the drawings with video to question the veracity of both maps and the media. 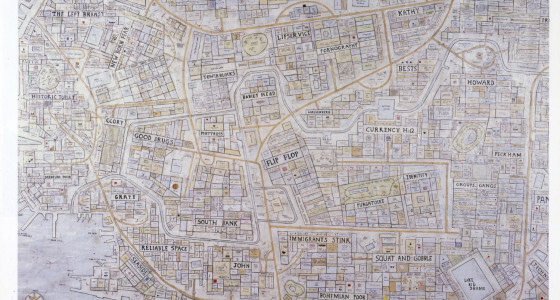 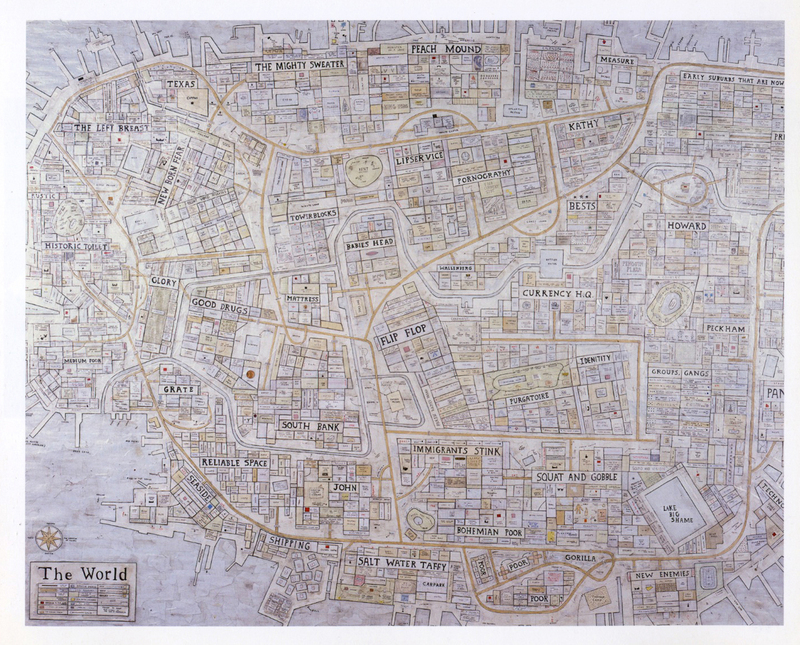 Simon Evans makes infinitesimal details on maps diagramming cities, places or states of mind that are filled with his wry commentary on everyday life. 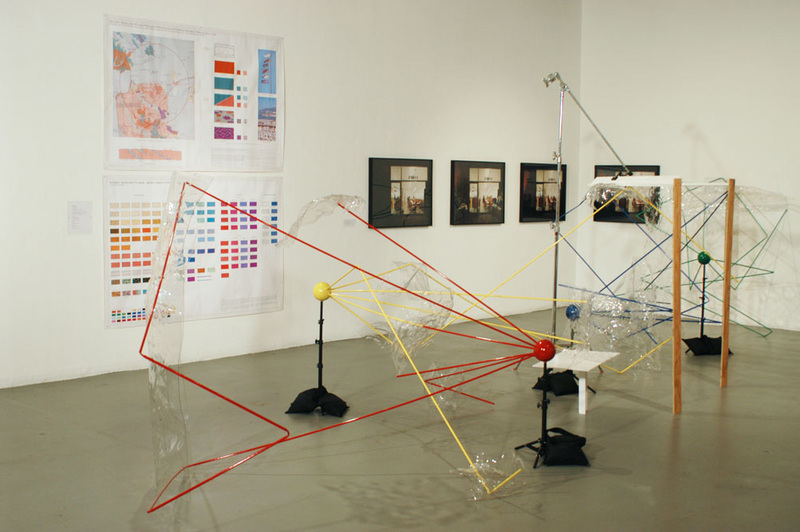 Tam Van Tran’s dense linear grids of trailing lights and flat expanses of color do not represent actual cities but are perceived as imaginary, fantastic, sprawling metropolises. 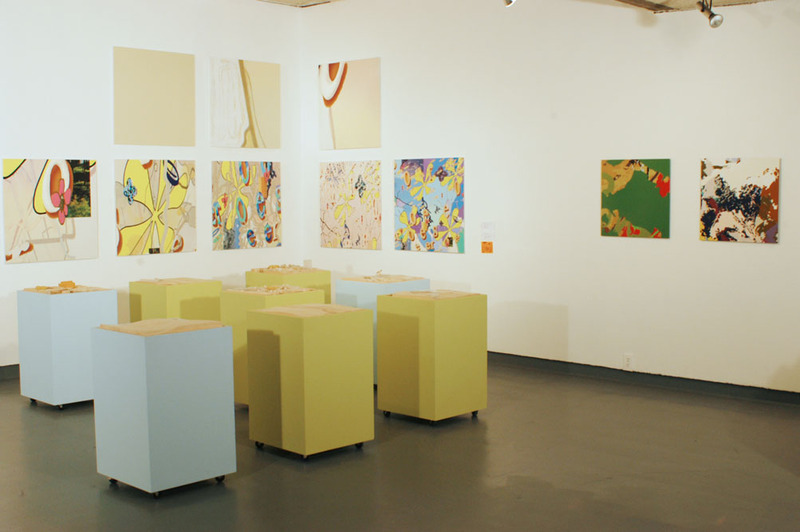 Adam Ross’ series of oil and alkyd paintings focus on imaginary landscapes floating precariously in celestial environment, while Sabina Ott creates a fictional landscape by combining paintings, prints and architectural models generated from a single digital image and derived from topographical maps of California. 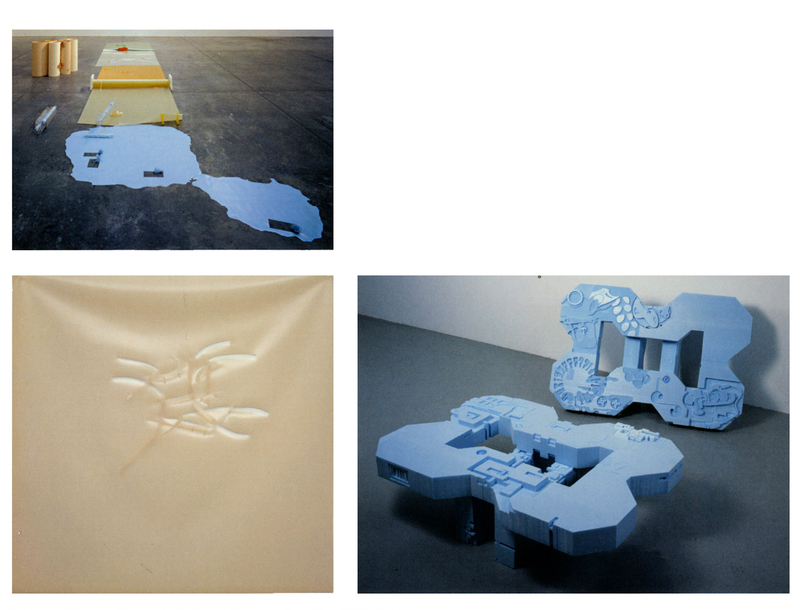 Shirley Tse’s wall and floor pieces of polystyrene, vinyl and other synthetic, pre-fabricated materials evoke both urban topographies or geological formations. 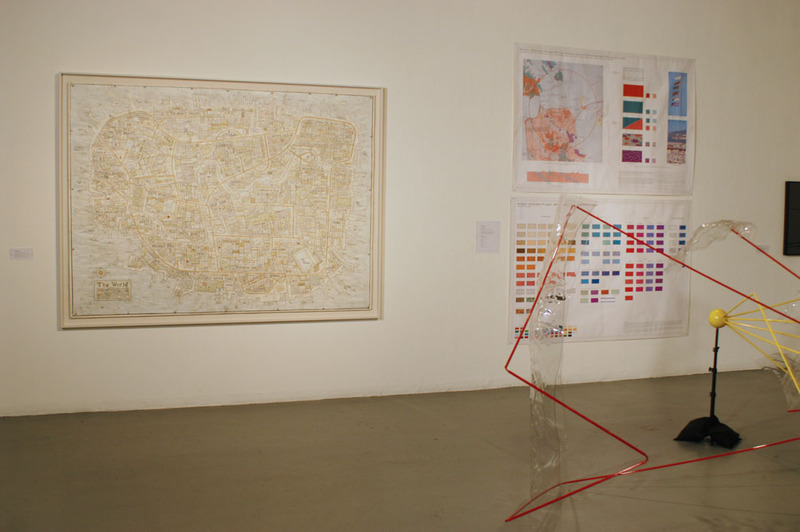 Artists also explored geo-political and linguistic terrains. 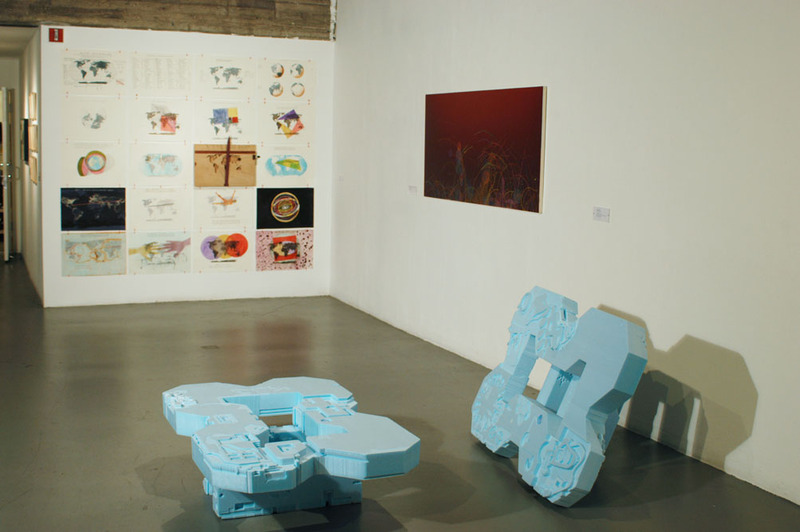 In The New Geometry, Charbel Ackermann used the geo-political term, “Axis of Evil” to critique language, education, and mass media. 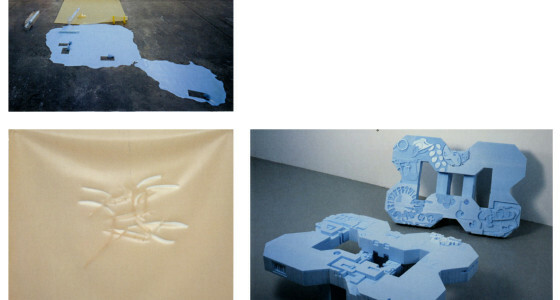 Jessica Bronson’s perpetual/perceptual, did not focus on natural events, but on the unnatural, “threat condition” of the post-9/11 era. 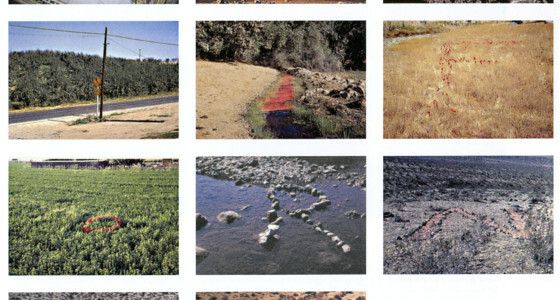 Rigo 23’s work also addressed current events as he recontextualized murals of names of geo-politically charged locations in Cuba or Iraq into specific sites in California. 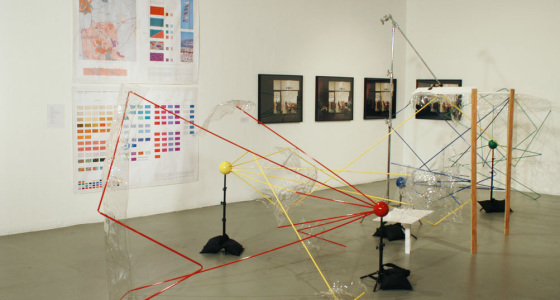 Finally, other artists investigated social topographies, mapping intangible and often unnoticed human interactions. 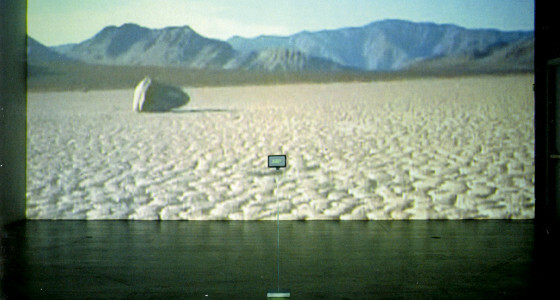 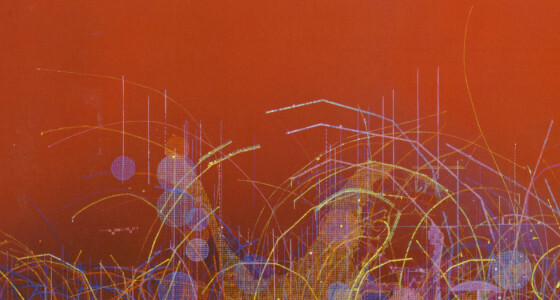 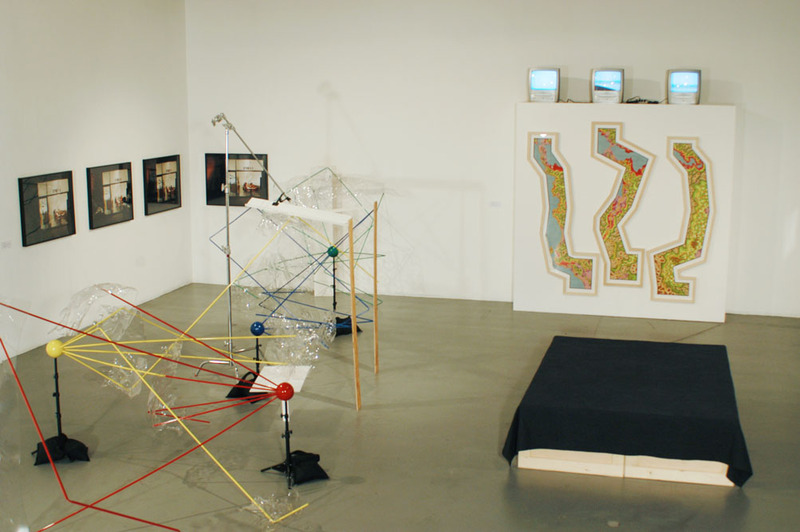 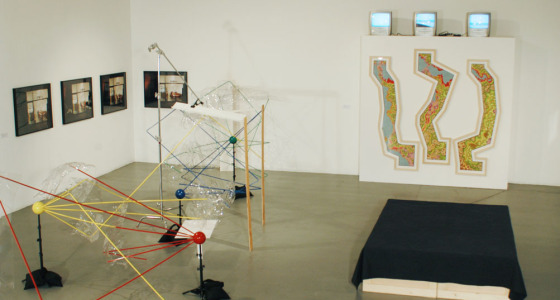 Through digital recordings from social interactions and other events, David Hinman created “sonic” topographies in sculptures based on from readings of heart monitors, or the computerized mapping of sounds from real life events.